The Glendale Trust a community based charity organisation secured funding to deliver a series of workshops on IT and broadband use for the local community of Glendale. Glendale is classed as a fragile area in the far North West of the Isle of Skye. The area has a mainly aging population as is made up of crofting and tourism based industries services in the area are limited because of its rural yet beautiful location. The community is diverse in skills and is active through many volunteer organisations working together for the benefit of the area and its inhabitants. The successful application for funds to citizens online for initial provision of broadband has so far been well received. 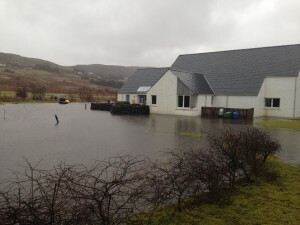 The Community Hall has provided a key centre for the provision of free wifi access for use by the wider community and also many of the visiting tourists. Having wifi connectivity at the hall has allowed a series of classes to be held in order to the hep local people learn how best to use broadband and computers. A series of 8 workshops/classes were originally planned and organised Each session of classes is launched through an open day where teas coffees and cakes are provided and the local community was invited to come to the open day to ask questions and enrol in further classes. As people register they are offered a series of individual workshops where each participant is given one on one time to deal with specific queries. The 1st series saw 3 people progress through 4 classes and they were given advice on a range of topics including but not limited to skype, email (with attachments) use of word, secure online payments etc. All the participants were over 50 but all picked up skills very quickly and worked on their own devices at home through a series of tailored “homeworks”. Unfortunately the area of Glendale experienced severe flooding in the middle of the classes as can be seen from the photo below and there was delay in series! Thankfully all the equipment and Hall was not damaged significantly and the 1st set of classes were completed early March. This series was specifically designed to operate around online safety and given the recent press around national internet awareness day it was developed to include the participation of the local primary school children. Dunvegan Primary which has a huge catchment area in the NW Skye agreed to send 16 p6 – p7 children to the Glendale Hall. 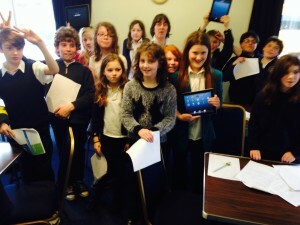 The reason for coming to the hall was to ensure that the children could access the internet via other devices such as ipads as the Highland Councils contract with Fujitsu does not allow this over the school network. A lesson plan was prepared and is attached as a separate email. The children seemed to really enjoy the 1hour long session. Another open for the classes was held in April and this saw 4 people sign up for the one on one classes which ran into May 2014. One key note from the second serried was that it was found to be more beneficial for some of the participants to have the classes carried out in their homes as they felt more relaxed and confident on devices which they were used to. In total the Glendale Broadband Project reached and engaged directly with a total of 7 local community members and 14 children (2 teachers) from the local Dunvegan primary school. The project has been deemed as a success due the significant amount of information and support that has been given to the community with regards to the development of their skills. The feedback from participants has been 100% positive and all very much wished to have the classes continued. From a tuition point of view it feels like the time has gone far too quickly and that several of the people engaged with the classes are on the edge of becoming much more confident in using the internet and associated IT devices. There has been strong support from the community with IT equipment being gifted to participants in the classes so that they had their own devices to use in their homes. It is clear not only from the feedback from the School children, headmistress and parent council that it would be extremely useful to follow up classes again with the children and also their parents. It is therefore recommended that effort is made to seek to engage further with the community especially with regard to those already involved in the project as their learning and confidence can only be improved. The provision of the wi-fi at the Glendale Hall is proving to be very popular with the tourists and locals alike, particularly on busy craft fair days over the summer months. The Trust is currently seeking to expand this project so that there is greater capacity for community access to IT learning and the use of broadband.